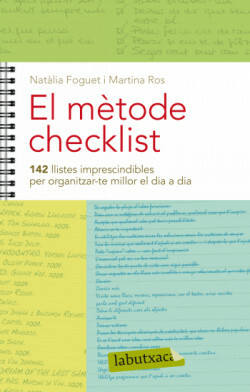 El mètode checklist will revolutionize the lives of everyone who uses it. 142 lists that offer you effective solutions to everyday household problems and good tips to get to know yourself better and find the keys to success. • Do you want to know everything you need when planning a trip, throwing a party or going shopping? • Do you want to not have to think again and again about how to do the same things, so you can avoid making mistakes? When you start reading this book, you will find that the checklist method is not only infallible, but essential. Take it wherever you go and don’t forget to personalize it to makeit even more effective. Once you’ve seen how well it works, you’ll spread the word. You’ll want everyone to know about it.